I do not like to admit it but I eat fast food a lot. One of my favorite places to go is McDonald’s. 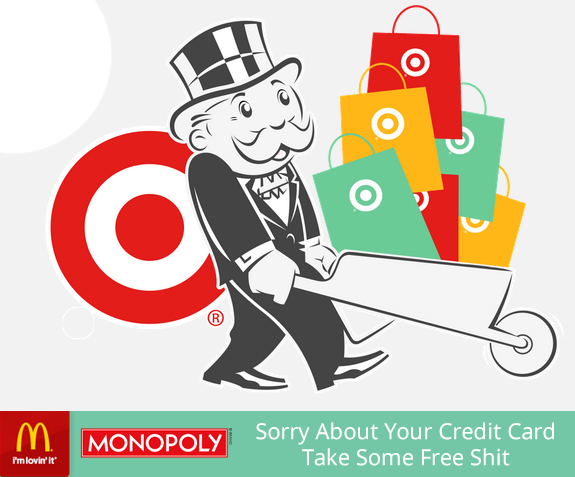 Recently they have brought back the Monopoly game. Which seems to increase their sales from 4 to 7% when they put it into action. As I was peeling off the first game piece of the season, I thought it was very interesting to see Target as one of the top companies participating in “The Hunger Game” this year. If you don’t remember last years hack below is some more data for you about it. Well it is coming up to the one year anniversary of one of the biggest retail credit card hacks. Just before Thanksgiving last year there was malware implemented in Target’s security and payments system designed to steal every credit card used at the company’s 1,797 U.S. stores. This resulted in 40 million credit card numbers being stolen and 70 million peoples personal information that could be used to steal peoples identities. As of February of 2014 the hack cost Target $61 million. This also does not take into account how much it cost the banks and creditors that had to issue 40 million new credit cards. So does the fact that Target is now giving away $1,010,000 in over 136,030 individual prices to McDonald’s customers restore your confidence in the company? Does it regain your trust? I do not think so. We should be seeing more advertising, and cross promotion happening down the road. So the moral of the story is the bigger the company, the bigger the mistake, the bigger you have to out promote, out advertise and market in order to regain your PR, your brand, your image and restore the trust in your company again.